I am a Disciples of Christ pastor and I'm trained as a historian and theologian. I care about my church and its message. I also am concerned that most Disciples are unclear as to who we are and why we exist. We revel in our freedom, but forget at times what binds us together. With that in mind I pursued publication of this small book, which has its roots in a series of sermons I shared with the three congregations I have served as pastor. It is now available from Wipf and Stock Publishers. 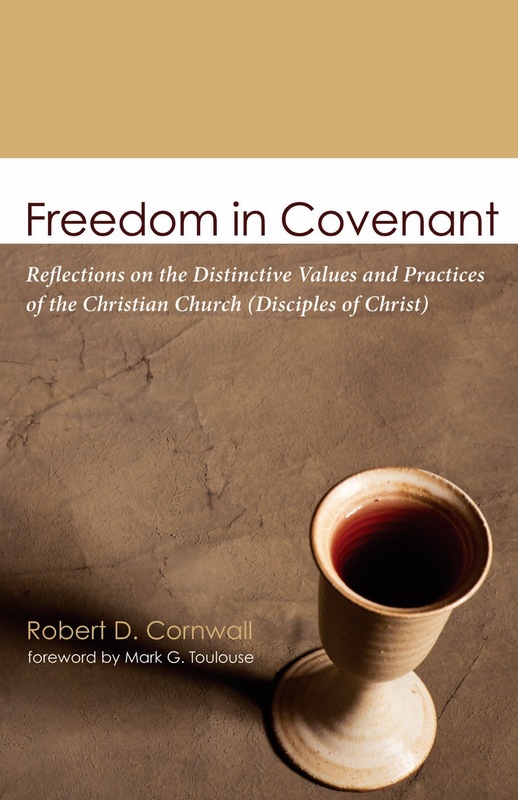 The book is titled Freedom in Covenant: Reflections on the Distinctive Values and Practices of the Christian Church (Disciples of Christ), (Wipf and Stock, 2015). In the book I cover Disciples values and emphases including freedom (in biblical interpretation), restoration, eschatology, sacraments and more. The title serves as a reminder that whatever freedom we hold dear is placed in a context of covenant. Without sounding too immodest, I believe that this book is essential reading for Disciples. I urge my colleagues to read it and share it with congregants. We are an ecumenically rooted movement, which calls for humility. But if we don't know for what we stand, then we must ask the question -- why do we exist? Here is my offering. In the service of that effort, I share endorsements from two friends and colleagues who like me love their church but want more for it. In short, in these pages you will discover something of what it means to be Christian. That result alone just might provide all of us with a worthwhile reason to pray for the survival of something like denominations and for accessible treatments of their histories. (p. xi).